A call has gone out to members of staff, students and the general public to take advantage of the monthly Biotechnology training programme, being held at the Federal University of Agriculture, Abeokuta (FUNAAB), to get acquainted with the latest technology and information on Biotechnology. 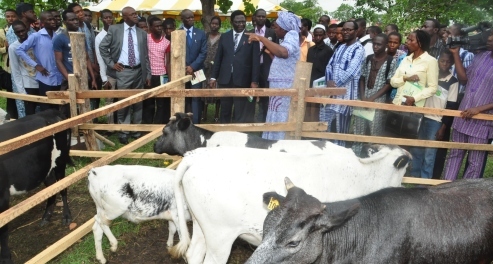 According to the University’s Director, Biotechnology Centre, Professor (Mrs.) Olufunmi Adebambo, the training programme would equip participants with the relevant skills on the application of technology to enhance, manipulate and harness the power of biological organisms for practical use; develop new bio-fuels; adapt to climate change; clean up oil spills and solve many problems that relate to man, plants and animals. She said courses to be offered include introductory Biotechnology, molecular techniques in the detection of human, food-borne pathogens and toxins, basic genomic analysis in animals, fishes and pathogens, molecular cloning and plant genetic transformation and micro-propagation, principles and application of enzyme-linked Immuno-Sorbent Assay (Elisa). Others are analytical methods using high performance liquid chromatography (HPLC), molecular techniques in finger printing and forensics and bioinformatics and phylogenetics analysis. Professor (Mrs.) Adebambo disclosed that as part of the University Management’s commitment to the capacity development of members of staff and students, the Vice-Chancellor, Professor Olusola Oyewole had approved a 50 per cent discount to interested staff and postgraduate students of the University, to enable them attend the monthly workshop. Professor (Mrs.) Adebambo said Biotechnology could provide important solutions to biomedical and environmental problems and was currently helping medical community with the latest advancement in the development of new medicines, diagnosis of ailments and finding solutions to incurable diseases such as cancer and HIV/AIDS. 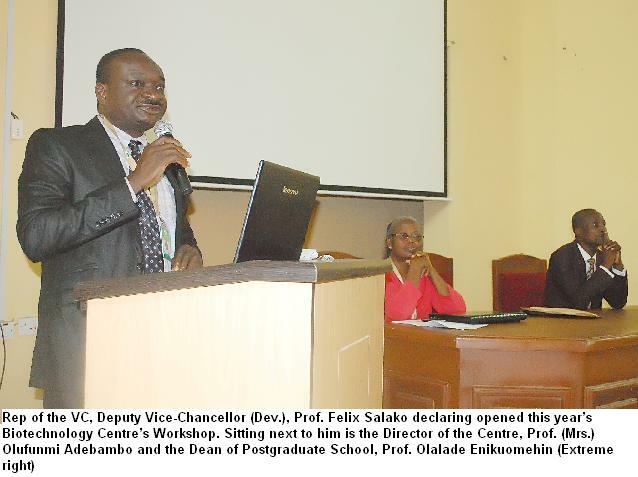 Earlier, the Vice-Chancellor of the University, Professor Olusola Oyewole, who was represented by the Deputy Vice-Chancellor Development, Professor Felix Salako, said that this year Biotechnology workshop was split into seven course modules, to cover the various areas of Biotechnology applications. According to him, Biotechnology started in 1750 BCE and had moved from plant micro-propagation to plant-transformation, which is known as genetically-modified organism to animal transformation known as transgenic and other transplants. Professor Oyewole added that agriculture was the biggest beneficiary of modern Biotechnology, as it had greatly reduced farmers’ use of insecticides in pest control because safe method were used in supplying nutrients to plant through Biotechnology, thereby, reducing environmental impacts. Heads of Departments are enjoined to forward the names of two, nominated postgraduate students, whose projects are relevant to Biotechnology while interested applicants are also advised to visit the University’s website: www.funaab.edu.ng, to generate an invoice at the Biotechnology Centre’s portal, which they could use to make payment for the programme at designated banks.